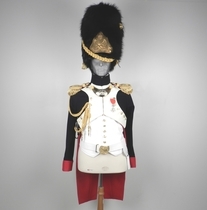 Habit au règlement de 1812 , vert plus clair que celui des chasseurs, pattes d'épaulettes incluses : 880 € . New, used in our precedent exhibition. 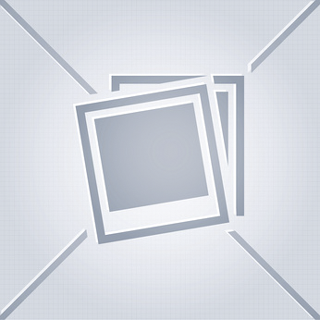 It is a rare opportunity to buy very nice uniforms at unseen prices for such a quality. 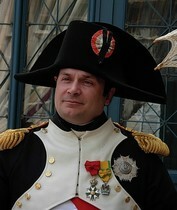 Slightly different of Napoleon Uniform, note gorget for instance, and of course bearskin hat! Price includes buttons, shoulder straps(not cut on picture, because they will be probably moved) and turnback ornaments. Sorry, we cannot translate all text. Just notice that Dominique Gaye Mariole was a very tall and strong soldier who was model for David in the painting: "La Distribution des Aigles". We made this uniform in 4 days. We took measurements on tuesday morning and delivered it on friday evening. We supplied all accessories except axe (an antic one). 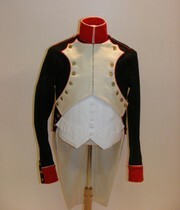 Made for an american customer from planches Rousselot and book: "Sous-officiers de Napoléon: La garde Impériale. Tome 1: infanterie..." of Francis Jolivet. 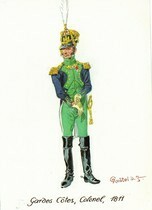 Tirailleur of Imperial Guard, 1813-1815, Belgium campaign. 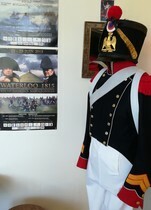 We made uniforms for a soldiers school in Mont Saint Jean, on Waterloo battlefield. 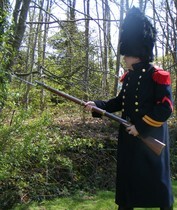 Volunteers will be dressed with our copies of Napoleonic uniforms, fully equiped with haversacks and rifles. They will visit battlefield, accompanied by an historian, re enactor himself. There was a "garde nationale" inside Garde Impériale! 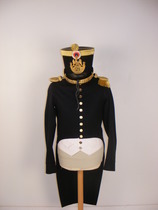 Uniform is very unusual, this is a mix of style of line and guard uniforms. 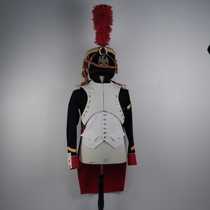 Turnbacks are very short, ornaments are those of voltigeurs, because in february 1813, this regiment become 7th reg of voltigeurs of young guard. They will mainly serve in Spain. 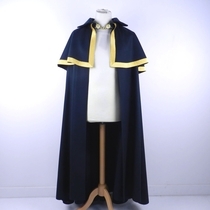 Coat is same as for line. 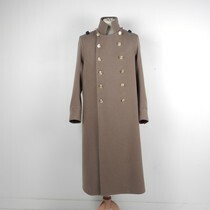 Long woollen formal jacket complying to the contemporary rules, with its heavy infantry buttons (brass). 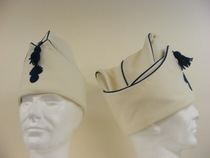 Including places for epaulettes and lip ornaments. Additional charge for buttons stamped with the regiment mark. Indicated price is only for jacket. 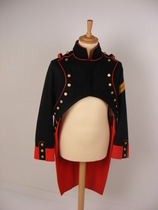 This uniform was less expensive that the precedent one, waiscoat was not necessary anymore, it uses less cloth. 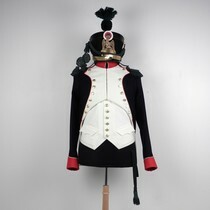 Some soldiers were fully equiped for russian campaign, but it was used in all army only in 1813. Imperial guard kept the precedent type of uniform with only light changes. Fatigue cap, troop, line regiments. White and blue melton for carabinier, price will be the same for other units, other colours, for troop. Just indicate what you want at the end of your order. Blue stars on turnbackas, they also could be red! 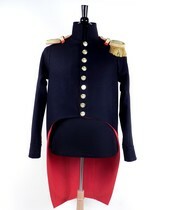 Indicated price includes jacket,epaulettes, waistcoat, gorget, trousers and shako.